This month saw the hosting of the Mine Ban Treaty intersessional meetings – the mid-year meeting of parties to the Mine Ban Treaty in advance of the annual Meeting of States Parties – with many countries giving updates on their progress towards achieving their Treaty obligations. Also in the headlines was the release of four deminers who had been seized by Sudan and accused of providing military assistance to South Sudan. There were also reports of landmine accidents and injuries in several countries and landmine clearance continues in Angola, Zimbabwe and the Democratic Republic of Congo. The biggest piece of positive news to come out of the Intersessional Meetings was the announcement of Somalia’s accession to the Mine Ban Treaty (All Africa). Somalia had been the only country in Sub-Saharan Africa outside of the Mine Ban Treaty, but now, with Somalia becoming the 160th party to the Treaty, all of Sub-Saharan Africa is under the Treaty regime. On the continent as a whole, only Egypt, Libya and Morocco have not ratified or acceded to the Treaty. Somalia now has four years in which it must destroy all stockpiles of anti-personnel mines (should be easy, Somalia is not believed to possess any such stockpiles, but some may be held by non-state actors like Al Shabab) and ten years in which it must clear all anti-personnel mines (a much larger task since the UN-recognized government of Somalia does not control all of the country and the 20-plus years of conflict in the country means that there are very few places uncontaminated by explosive remnants of war of one kind or another; although most are believed to be items other than anti-personnel landmines). An even greater ask for Somalia will be the provision of adequate victim assistance services to its citizens. With the constant risk of famine, Somalia will focus on providing basic human needs before tackling its health care system; most likely leaving victim assistance to the international community and international NGOs. In a good news, bad news offering at the meetings, Mauritania announced improved efficiency in its mine clearance and land release programs, while Burundi reported that mined areas still existed in the country despite its earlier claims to being mine-free (US Campaign to Ban Landmines, pdf). Mauritania had requested and received a five-year extension to its mine clearance deadline and is now dedicating adequate resources and using the latest techniques to be sure it meets that deadline. Burundi announced completion of demining with three years left until its original ten-year deadline expired and in retrospect, was too hasty in making that declaration. The ten-year deadline for landmine clearance is not an arbitrary deadline; it was based on the best estimate of the Mine Ban Treaty’s drafters about how long landmine clearance could be expected to take. Burundi’s desire to beat the deadline, while admirable, makes any future declaration of mine-free status, suspect. Four United Nations deminers who had been arrested by Sudanese armed forces while providing assistance and clearance expertise in South Sudan were released by Sudan. Thabo Mbeki, former South African President, negotiated the release of the four, a Norwegian, a Briton, a South Sudanese and a South African, three of whom had been working for the South African demining company, Mechem. The arrests, termed abductions by Mechem, occurred within a period of heightened hostilities, if not outright war, between South Sudan and Sudan over the oil fields that lie along the border between the two countries. The four men were unharmed, but there has been no word about the impact the abductions will have on future demining operations near the Sudan – South Sudan border (UK Press Association; Agence France Presse; Zoutnet). One of the largest hindrances to landmine clearance in the Sudans has been the constant presence of Sudanese soldiers in and around the disputed Abyei province. With the announcement by Khartoum this month that its army will withdraw from Abyei, landmine clearance can proceed and tensions over the status of Abyei can subside (BBC News). Angola has submitted an extension request for its Article 5 demining requirements, but continues to work on clearing the country. The Health Ministry will host a “Health Hall” later this year to help landmine victims and other persons with disabilities access rehabilitation and reintegration services (All Africa). In Cunene province, the National Demining Institute (INAD) destroyed anti-tank mines and conducted mine risk awareness (All Africa). The Social Minister, Joao Baptista Kussuma, travelled to Huambo Province to check on the demining progress there and received a report that 3.7 million square meters of land and 47 kilometers of road were cleared, destroying dozens of mines in the process, with the help of the HALO Trust (All Africa; All Africa). The US Army, in the form of the 184th Ordnance Battalion from Fort Campbell, Kentucky, travelled to Kisangani in the Democratic Republic of Congo in April to provide in-person training in explosive ordnance disposal techniques. In a bit of a puff piece from the Army’s blog, the participants were able to provide some context into the challenges of working in DRC, referring to the fact that the training site had no electricity and so the trainers relied on a blackboard to present their information. The DRC deminers also related their lack of knowledge about types of ordnance, despite living and working in a former battle site (US Army Africa Command). Kisangani had be the site of a pitched battle between Ugandan and Rwandan forces during the Congolese civil wars of the late 1990s and early 2000s with accusations levelled against the Ugandans of use of anti-personnel mines. South of Kisangani, in the Marungu highlands along Lake Tanganyika and the Zambian border, reptile specialists reported the discovery of a previously-unknown-to-science lizard. Remarkable for surviving in a landmine-contaminated area that had also been the site of fighting in the 1990s and 2000s, the lizard, Cordylus marunguensi , was described in the African Journal of Herpetology. The discovering scientists did not know if the lizard was endangered, but it’s possible that the presence of landmines and other unexploded ordnance had helped preserve the habitat by preventing encroachment from agriculture and herding (Mongabay). A very brief mention (in an Azeribaijani news site) was made of a 22 year-old Egyptian soldier dying in a landmine accident in the Sinai Peninsula. Millions of mines were laid in Sinai during the 1967 war between Egypt and Israel and these mines will not be cleared until a permanent peace is established in the Middle East (DPA). The Namibian Red Cross celebrated its 20th anniversary and took advantage of the festivities to outline the continuing danger posed by landmines to Namibians, especially those living in the Kavango region near the Angolan border. Bandits operating in the Kavango region during the Angolan civil war used landmines to shield their activities resulting in more than 200 casualties. The Namibian Red Cross continues to offer mine risk education to avoid additional injuries (All Africa). The crisis in northern Mali, precipitated by the Toureg rebellion, the presence of Al Qaeda in the African Maghreb, and the coup that toppled the democratically-elected government, has caused mass displacement in the country. The United Nations Children’s Fund (UNICEF) reports that more than 300,000 Malians, half of whom are children, have fled the violence, violence which has been exacerbated by the impending threat of drought and famine. Children’s rights are being violated by the armed forces as children are forced into soldiering and girls are abducted. Landmines injuries and fatalities have also been reported, but with the food and health crisis, care and support are unavailable (All Africa). Twenty-two officers from the Zimbabwe National Army (ZNA) completed a training of trainers course for deminers facilitated by the International Committee of the Red Cross (ICRC) as part of the capacity building efforts by the ICRC. The trained officers will be able to work with deminers and ZNA members in the mine-affected regions of the country, mostly along the borders, to train others in demining techniques. The ICRC official present at the graduation ceremony for the course reiterated the ICRC’s commitment to helping rid Zimbabwe of landmine (All Africa). Somalia was mentioned at the top of this post as the newest country to join the Mine Ban Treaty. 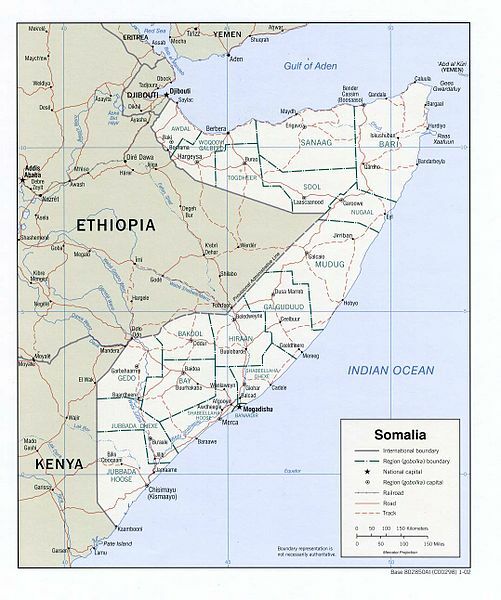 Somalia is also wracked by conflict as the Al Shabab militia uses guerrilla and asymmetric warfare tactics to resist the Transitional Federal Government (TFG) of Somalia, the African Union Mission in Somalia (AMISOM) forces supporting the TFG and the armies of Kenya and Ethiopia which are occupying large sections of the country. Al Shabab is using mines and improvised explosive devices in Somalia and around the refugee camps set up for Somalis in Kenya. In May, several blasts rocked the capitol of Mogadishu, targeting both military and civilians targets, killing and injuring more than 20 people (All Africa; All Africa). Ethiopian troops were targeted by a landmine in central Beledweyne (All Africa). Another four persons were killed and seven injured in a landmine blast in Galkyo, part of the autonomous region of Puntland, when security forces tried to defuse the mine which had been placed the night before (Mareeg). In addition, three Al Shabab members were killed when the mine they were trying to plant blew up in El Bur (All Africa). In Kenya, a landmine outside of Dadaab refugee camp, near a firewood distribution center run by the German group, GTZ, killed a Kenyan policeman and injured three others who were airlifted for treatment (All Africa). Another four soldiers were injured by a landmine near Madera town along the Kenya-Somalia border (All Africa). While terrible, the aftermath of these blasts is very troubling. Human Rights Watch is monitoring accusations of abuse by Kenyan security forces in Dadaab refugee camp and produced a long report detailed arbitrary detention, torture and other violations of human rights (All Africa). Kenyan soldiers were accused of looting businesses in Dadaab camp and shooting indiscriminately after the explosion there (All Africa). In Somalia, the body of an Al Shabab member who had been caught and killed carrying a landmine was “put on display” by security forces as a warning to other Al Shabab members (All Africa). Ethiopian troops shot and killed two civilians after the Beledweyne blast (All Africa). The United States government published its current landmine policy in 2004. Some of the key items in the policy include plans to “eliminate all persistent landmines from its arsenal,” “not use any persistent landmines — neither anti-personnel nor anti-vehicle — anywhere after 2010,” and “develop non-persistent (self-destructing/self-deactivating) landmines” (State Department). The US issued this policy in lieu of signing the Mine Ban Treaty and while the landmine policy is under review by the Obama Administration, the speed of that review and recent procurements suggest that there will be no immediate changes. Instead, the US Army, while developing the Spider Networked Munition System (see previous post), is also buying a lot of newly-made M18A1 “Claymore” anti-personnel mines, mines that do not have self-destructing or self-deactivating features in the current model. On February 14, 2011, the US Army issued a Request for Proposals for companies to make up to 255,000 M18A1 Claymore mines for delivery to the Army through April 30, 2016 (FedBizOpps, Solicitation # W52P1J09R0088). The total value of the contract, ultimately issued to Spectra Technologies, LLC of Camden, Arkansas on June 23, 2011, is up to $100 million over five years (FedBizOpps, Award # W52P1J11D0077). The problem with Claymore mines is the fact that they may violate the Mine Ban Treaty and the intent of the US landmine policy is to put the United States in compliance with most of the Mine Ban Treaty’s provisions without actually acceding to the treaty. The size, shape and usage of Claymore mines are very distinctive. Claymores are directional, fragmentation mines that use a small amount of explosive to propel 400 to 700 steel balls across a 60 degree arc and an “effective” range of 50 meters. US models have the words “Front, Toward Enemy” helpfully stenciled on one side so you know which way the steel balls will go. Claymores are meant to be used against people, not vehicles and referred to by the Army and others as “anti-personnel mines” (Military.com; FedBizOpps, Solicitation # W52P1J-09-R-0088; FAS). 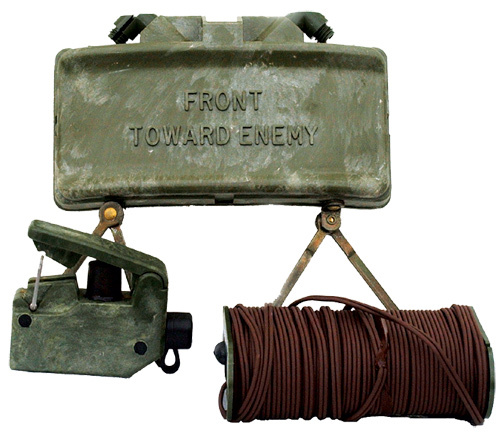 Because of the effectiveness of Claymore mines as anti-personnel devices, many armies, including the Chinese, Russian and Swiss, have produced their own variations. Claymore mines historically have had two modes: a command-activated mode and a victim-activated mode. In the command-activated mode, the soldier who has set up the mine will activate the mine using an electric detonator switch. In the victim-activated mode, the mine is set up with a trip-wire that activates the mine when the trip wire is broken. Not being a government contractor, I could not access the most recent Technical Data Packages for Claymore mine specifications (as part of solicitation # W52P1J-09-R-0088), but the basics of the weapon remain the same in the solicitation descriptions. The most recent description from the US Army office responsible for munitions describes Claymores as “detonated using an electric or non-electric initiation system and is used to deter enemy pursuit, establish perimeter defenses and conduct ambushes” (PMCSS). In the absence of an explicit mention that Claymores can no longer be activated via tripwires, I am willing to assume that tripwire-activation remains a possibility. It’s the victim-activated, trip-wire function that makes the Claymore mines controversial. According to the International Campaign to Ban Landmines, Claymore mines that are used solely in the command-activated mode are permitted under the Mine Ban Treaty. In 2003, only Sweden – among all States Parties to the Mine Ban Treaty, twenty of whom had reported stockpiling Claymores – had taken steps to modify its stock of Claymore mines to ensure they only operated in a command-activated mode (ICBL, pdf). By 2007, thirty States Parties had reported stockpiling Claymores, but only six – Belarus, Denmark, Lithuania, Moldova, New Zealand and Sweden – had modified their mines to prevent victim activation. These States Parties chose “to physically modify the mine to accept only electric detonation and some have physically removed and destroyed the tripwire assembly and appropriate blasting cap.” Some states, including Bosnia-Herzegovina and Germany simply destroyed all of their Claymore stockpiles rather than make the Treaty-mandated modifications (ICBL, Word Document; ICBL). In 2010, ICBL reminded the States Parties in attendance of the Intersessional Meetings in Geneva “to report on the destruction of sensitive fuzes and on steps taken to ensure that Claymore… Mines can only be used in Command-Detonated mode” (ICBL, pdf). The United States granted an exemption for command-activated Claymore mines in the export ban on landmines in 1992, however, the statements by ICBL and the fact that the model number for Claymores has not changed in many years, suggests that the M18A1 Claymore retains its victim-activated properties. Until the Claymore is completed eliminated or substantially modified to remove the “non-electric initiation system,” a fantastic euphemism for “trip-wire,” then the US can never be fully compliant with its own policies and has just ordered another quarter-million violations. Seems [Landmines in Africa] did not understand the significant of the last sentence (Ed. Note: Mr. Hiznay is absolutely correct, I did not). What is “shock tube”, or more specifically a “shock tube detonator”? When did the transition for Claymore initiation in the US? The M18A1E1 is the developmental designator for the modified M18A1, in practices it’s the same munition. Bottom line: there is no conspiracy in the term “non-electrical initiation system” – it’s a pyrotechnic system now, still command detonated. Thank you, Mark, for the clarification and explanation. If you ever have any additional comments on what you see here, feel free to post. Michael P. Moore, February 14, 2012. I recently had the opportunity to have a long and free-form conversation with Dr. James Cobey, one of the architects of the Mine Ban Treaty. As an orthopedic surgeon, Dr. Cobey has worked with landmine victims and amputees in Cambodia, Thailand, the Gaza Strip, Haiti and elsewhere in a long career with the American Red Cross, the United Nations and in private practice. Dr. Cobey was part of the three-person research team that produced Coward’s War: Landmines in Cambodia, written by Eric Stover of Physicians for Human Rights (PHR) (Physicians for Human Rights). Coward’s War served as a seminal document in the founding of the International Campaign to Ban Landmines. Later, Dr. Cobey (with Adam Kushner) wrote Measuring Landmine Incidents and Injuries and the Capacity to Provide Care, the authoritative guide for conducting landmine injury surveillance to assist governments and NGOs to understand the victim assistance needs in their countries (Physicians for Human Rights). When the International Campaign to Ban Landmines (ICBL) received the 1997 Nobel Peace Prize along with its coordinator, Jody Williams, Dr. Cobey was among those selected to represent ICBL at the award ceremony in Oslo, Norway. Dr. Cobey is also a founding board member of Health Volunteers Overseas and remains active with Physicians for Human Rights, including participating in demonstrations against indefinite detention at Guantanamo Bay. Dr. Cobey is a raconteur in the finest tradition and it was my pleasure to listen to him tell his stories and try to keep up. In the course of our chat we covered a range of topics including Guantanamo Bay, the Republican candidates for United States President, social media and its uses, the evolution of the mine ban movement from landmines to cluster munitions to small arms, parenting, and the best way to cook duck (Dr. Cobey is an avid hunter and brought, as a gift, two ducks he had shot and a bottle of Alsatian white wine that my wife and I should drink with the ducks). Two parts of the conversation stand out and I will let Dr. Cobey’s words speak for themselves. Dr. Cobey has remained active in lobbying the US government to accede to the Mine Ban Treaty, but despite the efforts of Senator Patrick Leahy (D-Vt) who drafted a letter to President Obama co-signed by 68 Senators (USCBL, pdf), the Administration has not made signing the Mine Ban Treaty a priority. The US participated in the most recent Meeting of States Parties to the Mine Ban Treaty in Phnom Penh as an observer, but the Administration has yet to complete its review of the country’s landmine policy (USCBL, pdf). The current US government policy on landmines is the one released under the Bush Administration in 2004 (State Department). But Dr. Cobey’s words are re-assuring: senior leadership at the Pentagon are supportive of the Mine Ban Treaty, a stance that past Defense Departments had not shared, but the Obama Administration is not willing to submit the Mine Ban Treaty to the Senate for ratification until after the 2012 elections and only if the necessary votes are there. Once the Administration’s review of the US landmine policy is completed, we’ll have a better sense of exactly how the Pentagon views landmines and the Mine Ban Treaty, but the continued pursuit of the Spider Networked Munition System and recent large-volume orders of M18A1 Claymore mines suggests that the Pentagon isn’t completely ready to renounce landmines. As in each month, there is bad news and good news coming out of Africa related to landmines. Conflicts in Sudan, South Sudan and Somalia continue to generate new landmine casualties while a renewal of conflict in Senegal over the separatist Casamance region also led to new incidents. In Zimbabwe, Uganda and Libya, remnants of long past and recent wars continue to plague residents. On the positive side, Angola continues to make slow, but determined, progress towards becoming a mine-free state, a status that Burundi was able to confirm. And in the United States, the 10th edition of the publication, To Walk the Earth in Safety, was released to much fanfare. Unity and Jonglei states and the disputed Abyei province appear to flash points for conflict in South Sudan. Oil-rich Unity state has been the site of the South Sudan Liberation Army (SSLA) rebellion and rebels have used Chinese-made anti-tank mines to thwart traffic along the roads around the capitol, Bentiu (All Africa; All Africa; All Africa). These mines represent a new threat where there had not been one in the past according to the UN Mine Action and Coordination Centre in South Sudan (All Africa). In addition, refugees fleeing fighting in Sudan’s Blue Nile and Southern Khordofan state have sought refuge in camps near Yida in the northern part of Unity state, but these camps are threatened by a possible spread of conflict from Sudan. The United Nations High Commission for Refugees wants to move the camps south, further into Unity state, but has not been able to declare where the camps would be due to fears that rebels will place landmines in those areas and because the roads southward have already been mined (All Africa; All Africa; All Africa). In Jonglei state, a local rebel leader, George Athor, was killed by the Sudanese People’s Liberation Army (SPLA), the army of South Sudan. In possible retaliation for Athor’s death, an SPLA soldier was injured by a landmine during Athor’s burial. The landmine incident, shortly followed by the killing of another SPLA soldier, led to a Christmas Eve massacre by members of an SPLA unit who fired indiscriminately on a church in the town of Khorfulus (All Africa). Athor’s death followed an outbreak of ethnic violence between the Luo Nuer and Murle communities which left 40 dead (All Africa). 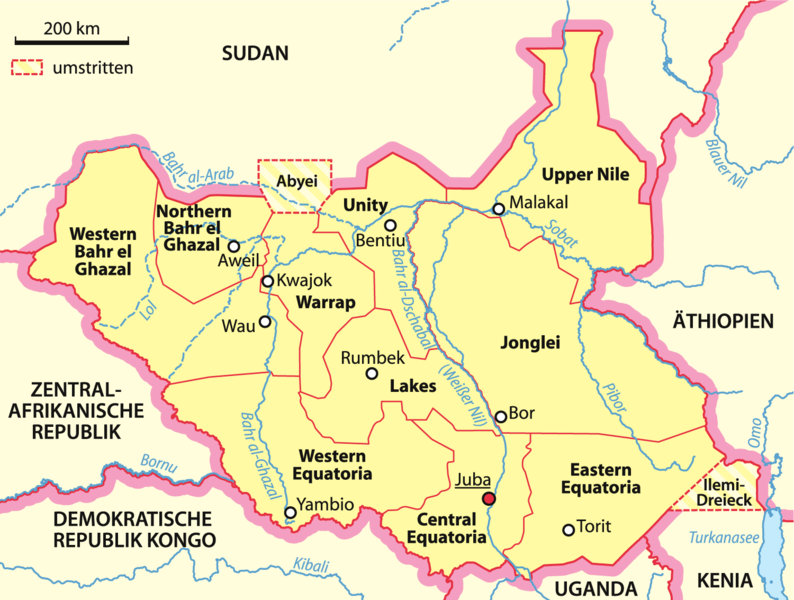 Abyei province is a region on the Sudan – South Sudan border whose status and sovereignty were to be determined by a referendum that has never been held. Sudanese armed forces have occupied Abyei since May 2011 and claimed sovereignty over Abyei in violation of the 2005 Comprehensive Peace Agreement. Situated on top of large oil fields, Abyei’s financial value to either country makes it worth fighting over; a fight Sudan appears willing to make and South Sudan does not. Because of the occupation by Sudan, the landmines that litter Abyei have not been cleared (All Africa) and those landmines are preventing refugees who fled Abyei during May’s fighting from returning to their homes (All Africa). 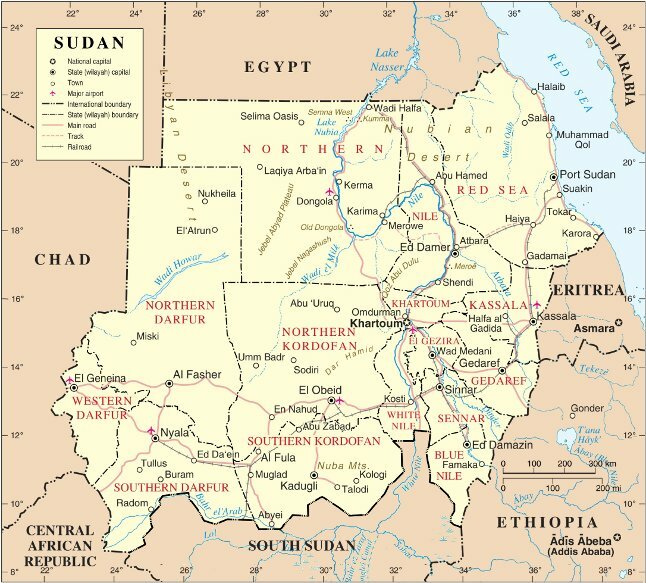 In addition to the conflicts in the Blue Nile and South Khordofan states mentioned above, Sudan is facing an emerging conflict in Kassala state. In Blue Nile and South Khordofan, the conflict is between the Sudan government and the Sudanese People’s Liberation Army / Movement – North (SPLA/M-N), an offshoot of the SPLA that has since become the army of South Sudan. During the Sudanese civil war, the members of SPLA/M-N were allied with the SPLA and since the signing of the Comprehensive Peace Agreement, the SPLA/M-N members have felt isolated and alone, left in Sudan when they may have wanted to be part of South Sudan. In the last few months, the Sudanese army has bombed villages and areas where the SPLA/M-N sought refuge in South Sudan’s Unity state. Sudan has barred access to Blue Nile and South Khordofan creating a “major deterioration in the condition of people there, including rising malnutrition, food insecurity and the dangers of unexploded ordnance and landmines” according to the United Nations (All Africa). Kassala state in eastern Sudan is the most-landmine and unexploded ordnance (UXO) affected state in Sudan according to Mines Advisory Group with 2 million square kilometers of land to be surveyed and demined. Kassala is also suffering from drought and despite being home to a major oil pipeline to the Red Sea, the state is poor and a burgeoning humanitarian disaster. Rebels from the Beja peoples have been training and arming themselves in the mountains along the Eritrean and Ethiopian borders and have recently joined forces with the Justice and Equality Movement (JEM) and the Sudanese Liberation Army, rebel groups active in Darfur in western Sudan. Observers expect the situation to deteriorate, especially if drought conditions continue, sliding into famine (All Africa). As Kenya’s intervention in southern Somalia enters its third month, landmine and grenade attacks – typically attributed to Al Shabaab – in Mogadishu and the Somali refugee camps in Kenya continue. In Mogadishu, the Transitional Federal Government started the month by denouncing a landmine attack that killed five women (All Africa), but the security situation has improved in some ways. Somali soldiers foiled landmine attacks (All Africa) and uncovered fifteen landmines that had been buried in the city (The Monitor). The ability of the African Union Mission in Somalia (AMISOM) to provide security in Mogadishu allowed United Nations Secretary General Ban Ki-Moon to visit the city in the highest-level visit to the country in years (BBC News). Despite these gains, landmines claimed four lives and injured many others in two separate attacks in Mogadishu (All Africa; Mareeg). In Somalia, despite the presence of Al Shabaab factions in Mogadishu, most of the landmine incidents occur in and around the border region with Kenya, apparently as retaliation for Kenya’s invasion of Somalia. Landmine or grenade attacks took place in the Dabaab refugee camp just inside Kenya’s border (All Africa; All Africa) while other attacks occurred along the road between Mandera and Wajir in Kenya’s Northeastern Province (All Africa; All Africa; All Africa; All Africa; All Africa; All Africa). These attacks have occurred as Kenya’s army drives further into Somalia and intensifies its fight against Al Shabaab. The advance has led to further landmine incidents as Kenyan forces enter the mine-affected regions of Somalia and as Somali soldiers support Kenya’s forces (All Africa; All Africa; All Africa; All Africa; All Africa). Also in Somalia, demining activities continue in the northern areas that constitute the semi-autonomous regions of Puntland and Somaliland. In Puntland’s “capitol” of Bosaso, a deminer was killed in a landmine removal accident (All Africa). While the Sudans and Somalia generated the most news stories involving landmines in December, Libya, Senegal, Uganda and Zimbabwe also experienced landmine incidents. In Libya Georg Charpentier, UN Resident and Humanitarian Coordinator for Libya, issued a call for additional funding for demining and mine risk education. He said that demining teams were under immense pressure to scale up their activities due to the widespread contamination of landmines from the year’s civil war, but those same operators were facing funding shortfalls (All Africa). In a related story, a landmine clearance company hired by the National Transitional Council of Libya has had to suspend work because the NTC lacks funds to pay the company and Western banks have refused to send monies to Libya due to past sanctions and concerns about the weak and unregulated financial sector (Reuters). Thus, while there is a need for additional funds to pay for demining and mine action, the government of Libya is not in a position to support those activities. As part of an apparent return to violence over the separatist Casamance region, a Senegalese soldier was killed by a landmine in the region following a military operation against the Casamance Movement of Democratic Forces (MFDC) that resulted in the loss of several Senegalese soldiers (All Africa). In northern Uganda, thousands of persons displaced by the Lord’s Resistance Army in Lamwo district are still living in camps as Uganda’s demining teams remove landmines that had been placed in and around the homes of the displaced. In addition Uganda’s Mine Action Programme Coordinator said the Ugandan demining program lacks adequate funding and Uganda is in jeopardy of missing it August 1, 2012 deadline to complete demining – a deadline that has already been extended once (All Africa). Zimbabwe faces extensive landmine contamination from its civil war in the 1970s and in the town of Beitbridge, along the border with South Africa, a man suffered injuries sufficient to require amputation of both legs when he set off a landmine whilst preparing timber for house construction. The incident highlights the need for both demining and mine risk education in the country (All Africa). At the Twelfth Meeting of States Parties to the Mine Ban Treaty in Phnom Penh, Cambodia, Burundi formally declared that all demining activities in the country had been completed and Burundi is now free of all anti-personnel landmines. Burundi had had a deadline of 2014 to complete the demining, but with the support of Mines Advisory Group, DanChurchAid and the Swiss Foundation for Mine Action, Burundi completed the demining three years ahead of schedule. Whilst the country still faces contamination from unexploded ordnance and other explosive remnants of war, the clearance of the last anti-personnel mine is great news and an example to other countries in Africa, many of which have (or will) require extensions to their demining deadlines (AlertNet). Angola is one of the most mine-affected states in the world, but each and every month the country and its demining authority, the Angolan National De-mining Institute (INAD), makes slow but steady progress towards the clearing all landmines from the country. Over one thousand anti-personnel landmines and one anti-tank landmine were cleared from Quipungo district (All Africa); 44 personnel mines and six anti-tank landmines were cleared and destroyed from northern Bengo Province (All Africa); and 4 million square meters of land and 96 kilometers of road were cleared of 174 anti-personnel landmines, 3,217 Uxos and seven anti-tank mines in Kwanza Sul province (All Africa). December marked the release of the 10th annual edition of the State Department publication, To Walk the Earth in Safety, which details the US government’s humanitarian demining and mine action programs. US Secretary of State spoke at the release of the report which details the $201 million provided to 49 countries to “clear explosive remnants of war and destroy excess stockpiles of weapons and munitions” (Voice of America). Clinton and the US recognize the threats posed by landmines, saying, “Landmines render thousands of acres of land unusable and literally tear away the fabric of communities unable to farm land, to walk safely from village to village” and Assistant Secretary of State Andrew Shapiro referred to the Obama Administration’s review of the US government’s landmine policy, saying, “Thus far our review is taking into account what impact it would have on our ability to conduct military operations… After that review is done we will come to a decision about the best way ahead, but that should not in any way detract from the significant efforts the United States has made” (Bloomberg News). Specific to Africa, To Walk the Earth in Safety documents the $26 million the US provided for mine action in 2010 to Angola, Burundi, the Democratic Republic of Congo, Ethiopia, Guinea-Bissau, Mauritania, Mozambique, Senegal, Somalia and Sudan. The US has also provided assistance for conventional weapons destruction in Kenya, Namibia, Rwanda and Sierra Leone (State Department). The report was released on Monday, December 19th. On Thursday, December 22nd, the US Department of Defense issued a $1.4 million award to Spectra Technologies, LLC of Camden, Arkansas for landmines, probably M18A1 Claymore mines (FedBizOpps Award # W52P1J11D00770002). The ink on a report about how the US works tirelessly to rid the world of the threat of mines had barely dried before the US was ordering new mines. Sometimes the brazenness of the hypocrisy stuns me.